Casting our minds back to April 2018 and the Offshore World Championship here in Quepos, all tournament records were broken for the size of the Dorado caught with the largest Dorado weighing 62lbs with the top six fish all being over 45lbs! So why all the fuss about Dorado? Well not only are September, October, & November our peak Dorado fishing months here in Quepos but we eagerly await the very first Marina Pez Vela DORADO DERBY which is set to take place on November 17th. We are really excited about this one! The tournament really is open to all, tourists, locals, novices, pros, with just a $250 team entry fee and a one day heaviest fish format, meaning literally everyone that enters could stand a chance of winning the event. Charter boats, private boats large and small are all eligible to enter the DORADO DERBY and this event marks the start of the 2018/2019 Marina Pez Vela tournament season, for sure it is one that you will not want to miss! This will be a fun event with Weigh-in, dock social, fish fry and prize presentation following the fishing. Come down and join the fun at the Marina on November 17th, all are welcome! 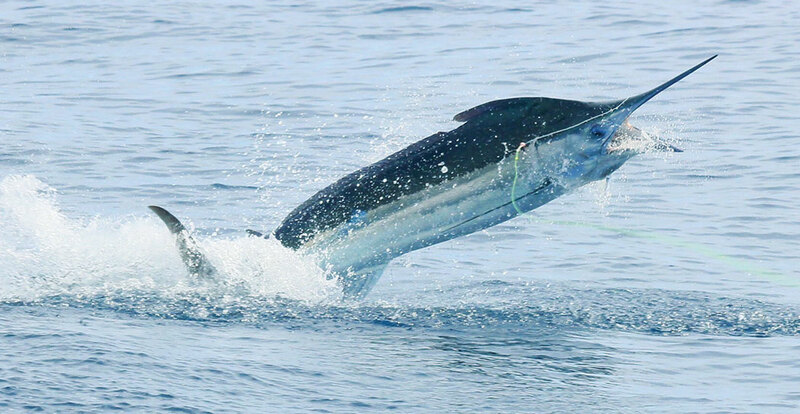 We had some excellent fishing here in Quepolandia during August with good numbers of Blue Marlin released by the fleet. Most of the Marlin are in the 150-250lb range, with occasional larger Marlin also. Many of the boats in the fleet enjoying some GREAT Marlin action. Releasing 1 Marlin in a day is already the perfect day but many of the boats have released 2, 3, or even 4 Marlin in a day which is simply incredible fishing wherever you are in the world. Capt. Franklin on the Big Eye had a day releasing 4 Blue Marlin and another day with 2 Blue Marlin and 5 Sailfish, simply incredible. There were some great Sailfish days also with the guys on DOUBLE NICKLE having a few great days with more than 20 Sailfish raised. CARIBSEA broke all of their own boat records during multi day overnight trips to the Marlin FADS & Seamounts during July & August producing some really impressive numbers of Blue Marlin. One husband and wife duo releasing 12 Marlin of the 18 that they raised in just one day of fishing and another group releasing 29 Marlin in 3 days of fishing! There has been some great Wahoo fishing in July & August over the Offshore reefs and underneath floating debris. 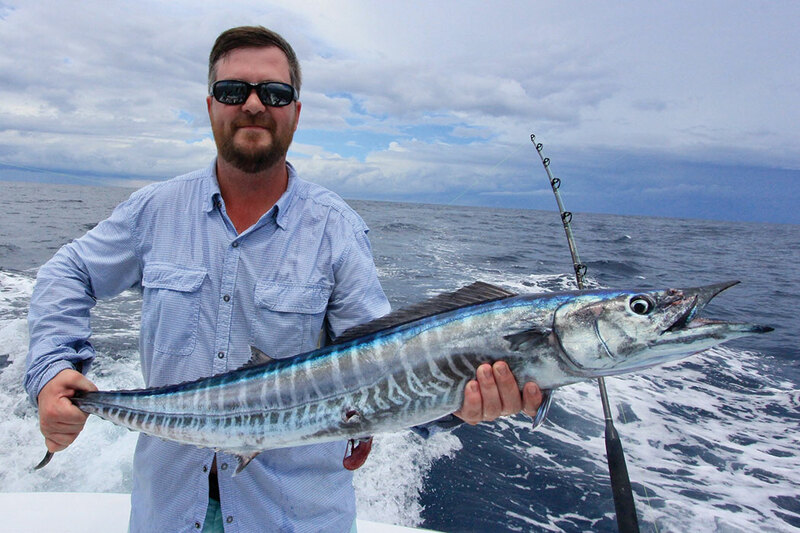 The fleet experience a slammer Wahoo day during early August with the 44’ MAKAIRA & 31’ GOOD DAY catching 5 Wahoo each and several other boats also getting in on some great Wahoo action. Captain Junior & Captain John from Quepos Fish Adventures have enjoyed some great Tuna fishing with some really nice sized Yellow Fin Tuna caught recently up to 150lbs. 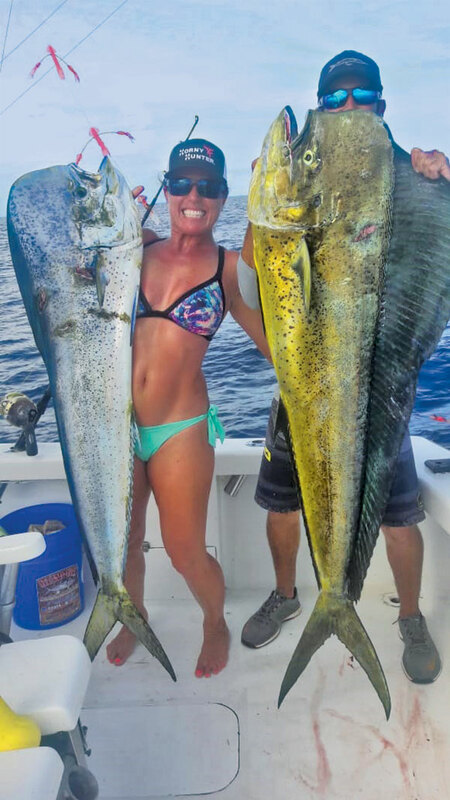 If you want to experience a short trip on the water, then a half-day Inshore trip is your best option. With the seasonal rains at this time of year there are days that the Inshore conditions are not ideal and on occasions getting live bait which is important for a successful trip can be tricky. When we get good bait there are some nice sized Roosterfish to be caught at this time of year in addition to some Mackerel, Jacks, Snappers and occasional Snook. If conditions are not ideal for inshore then your Captain can take you 8-10 miles Offshore on a half-day trip looking for the current and debris lines that are common this time of year. 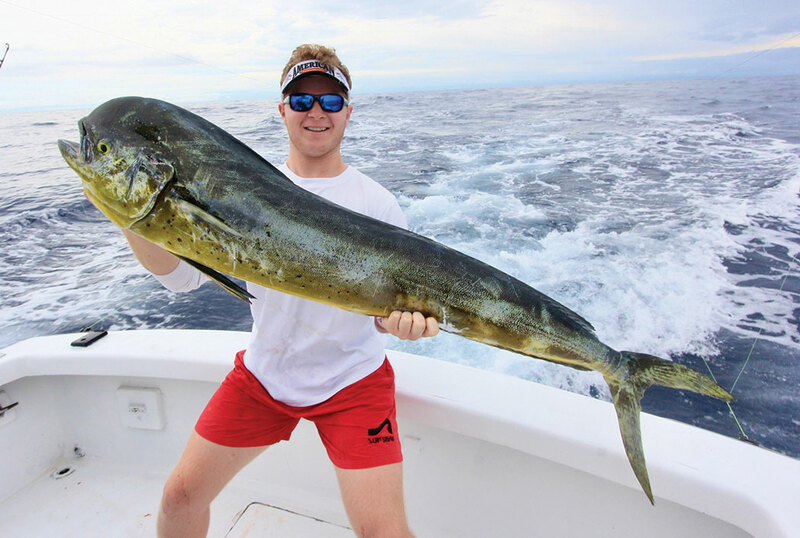 Find a floating log, tree or similar and there is a good chance that the Dorado/Mahi Mahi will not be far away! See marinapezvelatournaments.com for further details!